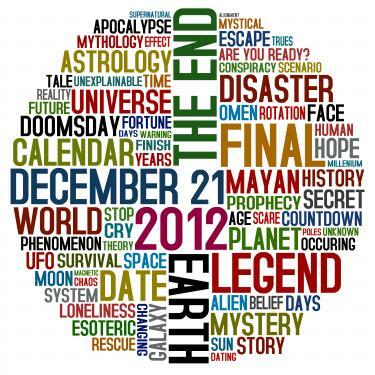 Whether you are bracing yourself in your homemade bunker for the Mayan-predicted apocalypse or too busy or cynical to waste time laughing at the gloom-sayers (there was an official cancellation of the 'End of the World Proclamation by some after all), there is an opportunity over the next few days to change the way you are living. Here's what we vote you scratch off your to-do list in the final days of 2012 (and maybe, the final hours of all time). That pile of old papers and unopened mail that has been sitting on the floor next to my desk for more than year? I am putting that all in a cute reusable bag and stashing it in the basement. Come the end of the world, I do not want to be surrounded by clutter. And if the world is just fine, I can unearth all that crap to sort. Next year. Finally! Rationale for steering clear of the worst place on earth to be at the holidays! If you feel guilty about not preparing fully for the Christmas that is supposed to happen a few days after the end of world, consider that hell is also probably littered with stuffed animals and half-opened boxes of Legos and stoned customer service agents wandering about helping no one, so you will make up for it then. This is a rule for living, no matter when the Mayans say we are done. Ignore the size on the label and buy a pair of jeans or adorable swingy dress that fits every curve the way you like it. Ditch anything in the closet that doesn't fit, barely fits or fingers crossed, might fit again one day. Spend the final hours in sequins, denim, stripes or anything that makes you feel hot. We all know you not only have not ordered them yet, you also have not convinced all the members of your family to stop being cross-eyed while wearing semi-coordinated sweaters long enough to snap one good photo. Forget it. Let your closest 800 friends and acquaintances stalk your Facebook photos if they really want to know what you have been up to in 2012. Then take the $150 you would have spent to print up cards and stick on stamps and take your hellion children to a restaurant you've been wanting to try but have been too worried is not appropriate for kids. Since you won't be writing a holiday letter next year, then you won't have to be concerned about capturing the moment at all. You have a Santa size to-do list, not to mention that mega work project due before the end of the year. If you constantly try to squeeze in more more email, phone call or spreadsheet before you call it a day, think about how many hours/week you spend working than you intend to. Fuhgeddaboutit.... and set your limits. 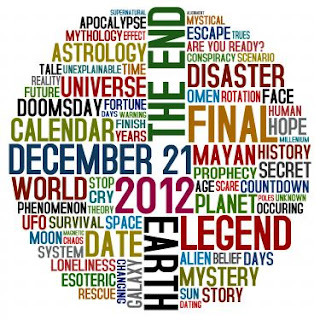 If the world is going to end, is that how you want to spend your last days? This is the perfect opportunity to raise your holiday spirits with girlfriends, your loved ones or even the crabby neighbor downstairs by toasting to ten things you've loved about living this life. If you must, start at 3 without guilt. And if you don't imbibe, sparkly pomegranate juice is a lovely way to say farewell. This is the time to put the lingerie to use. And if that is not comfortable, close the bedroom door away from the kiddos and sleep showing off the skin you're in. If you end up in the afterlife in the buff, you can always say that your sensible flannel jammies were singed off in explosion. You've been practicing the ignore-complainy-children strategy for years. Now is the time to fully implement it. As soon as it starts, close your eyes, shake your head slowly and just mouth "no" over and over again until they give up and go away. Unless you are in the car. Then it is probably wise to pull over first. It sounds cliche, but seriously, when was the last time you stopped for even a few moments to appreciate all the holiday cheer around you? The little things your kids do EVERY DAY that are easily missed if you're not paying attention? The way your husband still looks at you when no one is watching? The brightness of the stars in the night sky? You get the idea. No matter how many days we have, shouldn't we take in as many of these moments while we still can?